Stardoll has officially announced that we will have a new collection of LE soon, but first we have a contest of who will be the face of the famous brand. The Face of LE will model the new collection and be seen across the Stardoll universe. Do you have what it takes? The new LE collection is coming soon, and it’s bound to be a hit, with inspiration from 90s grunge, hip hop and superstar model Kate Moss! Use your imagination and show us your interpretation of what the new collection would look like if YOUR STARDOLL was the model. 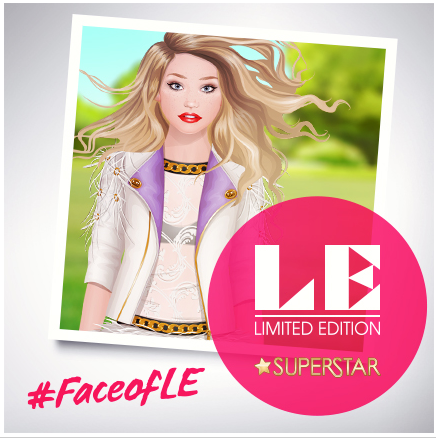 To show off your model looks and style, make sure that you are Superstar, take a stardoll selfie and post to Instagram using #FaceOfLE – it’s that simple! Make sure to show off your selfie before 20th July for the chance to win this place in the spotlight, along with a selected Limited Edition piece. Those are the criteria's to be selected. Update -- you can either post the photo on your Instagram or Twitter.